Sitting to compose this post is giving me a sense of Déjà vu, for I feel that I’ve complained about the weather on Cape Cod before; Joanna and I were there over the weekend. Sunny skies and fall colors accompanied us as we made our way through Pennsylvania, New York, Connecticut, and Rhode Island. As we entered Massachusetts however, and especially as we crossed the bridge over the canal, the weather began to close in. By the time we reached our destination the wind was up, the clouds had gathered, and we were surrounded by a veil of salty mist. Conditions hadn’t improved the next morning. Foul weather be damned, I grabbed my camera. The combination of wind and tide made me glad for the shorts I was wearing. Diffuse light and thick clouds made for a dull, monochromatic, seascape; at least that was my first impression. 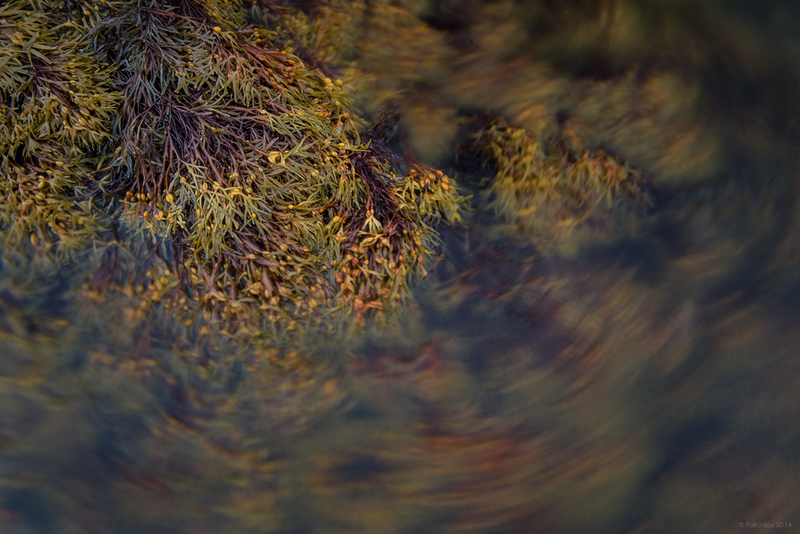 The tide was falling and of a height that exposed the tops of a number of large rocks which were low enough on the shore to be covered in lush carpets of seaweed. As I walked I was impressed by contrast; the wind, current, and tide combined to move the submerged fronds, back and forth, liberated, swaying, while emergent layers lay flat without the buoying influence of their natural habitat and under the oppressive pull of gravity. When I looked closely I could see tiny invertebrate animals, some below the surface and others above it. I watched, fixed by my interest. I am fascinated and, dare I say, entertained by this intertidal environment which is visited by few of us and understood by even fewer. So many have explored fields and ponds and woodlands and streams. An increasing number of nature enthusiasts take great pains to understand how it all works, by learning the names of the birds and knowing how to identify the trees, wildflowers, mushrooms, amphibians and reptiles. Many make a seasonal pilgrimage to the shore to relax and vacation, but fail to learn about the adjacent habitat. It seems that unless we hear news of the ocean, such as the reported loss of the Deep Water Horizon drill rig or the ongoing search for Malaysia Airlines flight MH370, few concern themselves with it. That seems curious when one stops to consider that more than two-thirds of the planet is covered by the sea. I must explain that I grew up a child of the Cousteau generation and remember each installment of that classic series, The Undersea World of Jacques Cousteau. That childhood fascination lead to snorkeling and to SCUBA diving, to underwater photography, and to a summer job as an assistant naturalist on a near-shore oceanic island in the Gulf of Maine. Although professional obligations and responsibilities have drawn me from the ocean, I feel close to it from even long, overland, distances. I feel this connection because the ocean and its inhabitants formed some of the many facets of my early life. As I walked among the seaweeds, the gastropods, the bivalves, and the crustaceans, the names came back to me like very good friends of long ago. Fucus, Ascophyllum, Littorina, Mytilus, and Pagurus. There is so much to know and to be acquainted with.